It can be a frustrating and costly matter to find replacement windows for your home or place of business. However, when you rely on a company such as Intex Windows & Doors, you can get what you need for Windows Replacement in Glendale with ease. You can make a decision that you will be happy with when you purchase windows and doors for a newly constructed home, or replacement fixtures to be installed in your commercial building from this top quality distributor. Once you begin shopping from Intex, you will see the immense benefits and not want to go with anyone else for your quality fixtures. You should have the very best exterior and interior design products that enhance the luxury and efficiency within your property, and that is entirely possible with Intex. With the gorgeous clean lines, energy efficient features, and beautiful materials, you are going to be hard pressed to find better products elsewhere. Take a chance on Intex Windows & Doors today. The whole issue with Windows Replacement in Hancock Park is that you will have to learn whether or not you need to get a permit in order to take any action. Do your research early and thoroughly, so that you know what kind of steps you need to take in order to proceed. This is where Intex Windows & Doors comes in, because we will be able to assist you in finding out if a permit will be required where you are located. It is a relatively simple process when you think about the fact that your project can be held up if it is found that you started installation before getting this permit. Save the headache and hassle by conducting this step before you begin the process. Then, you can get on with the more important things with your business and with life in general. Milgard Triple Glass Windows are an amazing series that you will be able to purchase through Intex. Check out these Milgard windows, as well as the other series that are available from this company and others. You will absolutely love the options that we have in stock. The catalog is extensive and will allow you to see everything that you will end up getting, including a detailed description of the different models. Put your attention into searching through the catalog with its easy links that you can access right from our home page. You do not have to venture out into warehouses and specialty stores ever again when you know that you can depend on Intex Windows & Doors. 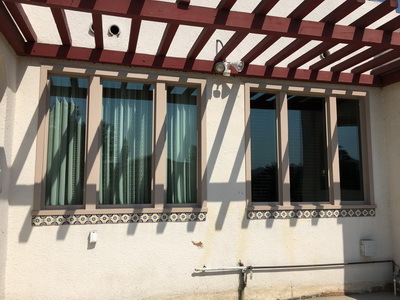 If you are having trouble locating just the right products to complement your home or place of business, you are welcome to talk to a representative about making a customized order for your Windows Replacement in Glendale. Place a call to us with any questions you have and find out how easy it is to get amazing door and window fixtures. You will be pleased and want to stay a loyal customer for the long haul.